Ask yourself this question? Is it easier for me to give or receive? For many of us, it is much easier to give. We may have grown up being told that it is better to give than to receive. We have been told that being generous is noble and receiving and accepting praise is prideful. If you find this is true for you and it’s more difficult to receive, begin to notice how and when it is uncomfortable for you. Is it more difficult to receive someone’s time? Money? Love? Praise? Science has now proven that we live in an infinite Universe where energy is neither created nor destroyed and in fact flows and expands where our attention goes. When someone gives you a compliment and we are able to actually receive it with grace and gratitude, it gives them a gift back. You are energetically telling them that they matter. That what they say matters. That you are truly receiving the essence of their communication. The energetic cycle remains unbroken and expands. When you receive, you are giving and when you are giving, and they receive it, you are getting something back. Giving and receiving is the same energy. Conversely, have you ever given someone a compliment, let’s say on a speech they delivered that you truly thought was exceptional, and they say, “Oh I was terrible. I kept stammering”. Bam! By discounting your compliment, they have stopped the energetic flow. When you give a compliment and it is discounted, how does it make you feel? Discounted right? Perhaps that your opinion doesn’t matter. Often, when someone compliments us and we discount it, it can be habit, an automatic response to our subconscious conditioning. It takes practice to interrupt that pattern and be mindful of our response. Next time someone gives you a compliment, pause, take a breath, and say “Thank you”. Really breathe it in. The urge may be to try and return the compliment, but avoid doing this. Receiving authentically is the gift to them. By truly receiving their compliment you have expanded your energetic cycle and are in synergy with them. The same thing happens with “I love you”. How many times do you quickly say to your partner, children or friends as you are hanging up the phone, “I love you”? Do you mean it? Hopefully. But are you energetically infusing the words with your love, or is it just habit? When you say it, are you subconsciously holding your ear up towards them so they say it in return? Try this. The next time someone says “I love you”, again pause, allow that love to come into your body, space and heart and simply say “thank you”. This may feel uncomfortable at first. You may feel like you need to immediately say “I love you back”. I do this with my husband all the time. It takes practice. When he says “I love you”, I really take it in and feel that love for the gift that it is and thank him. I don’t just curtly shoot back, “love you too”. Then, when I feel called to tell him I love him, it is coming from an authentic, divine timing and he is able to receive my declaration of love. We know that when we say it, we are consciously choosing to do so. 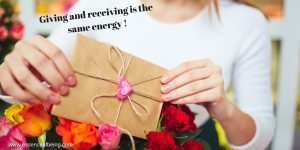 So remember – The energy of giving and receiving is the same! Where attention goes, energy flows. Begin practicing receiving whether it be a compliment, time or gift with the energy it deserves and you will find that you are bestowing a gift on the giver as well.